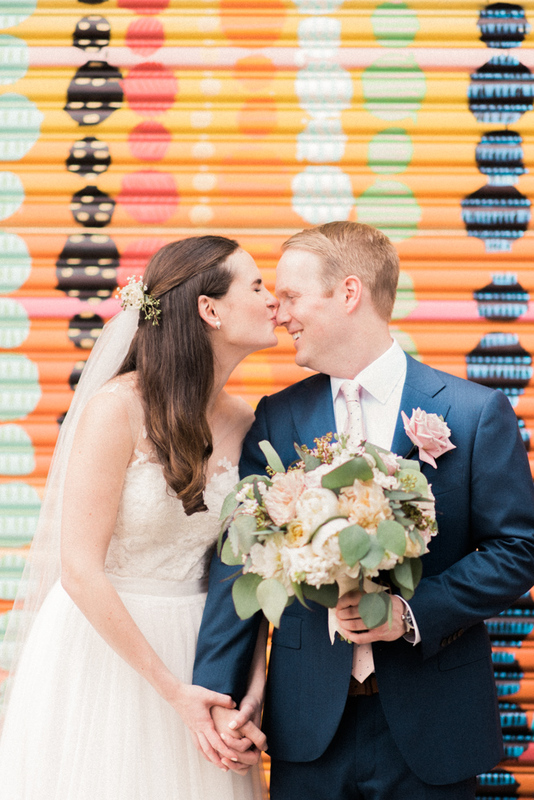 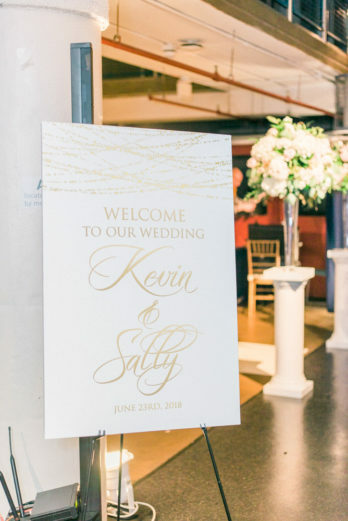 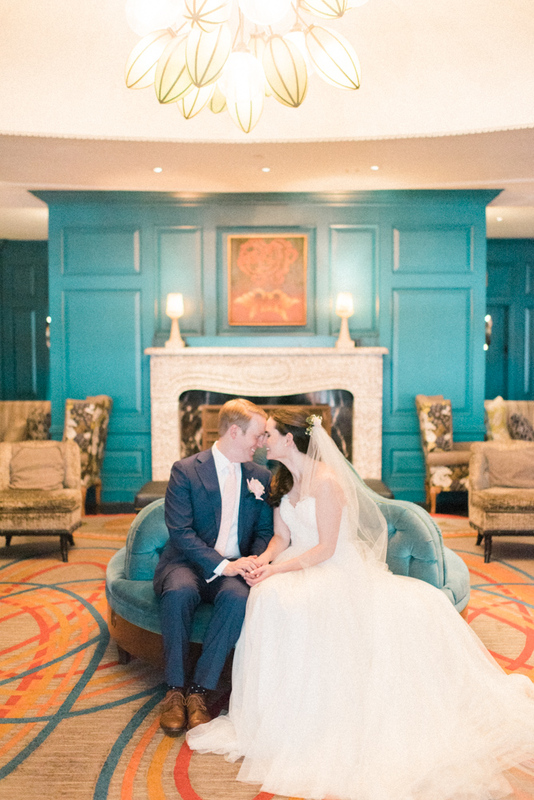 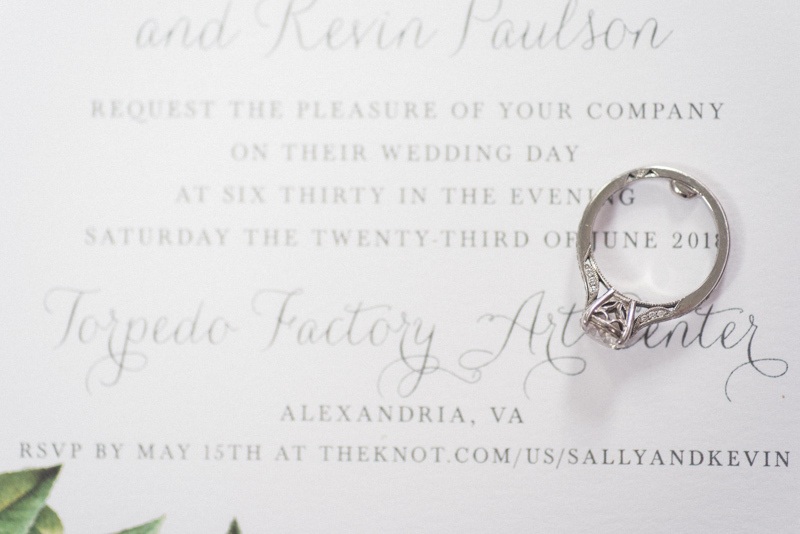 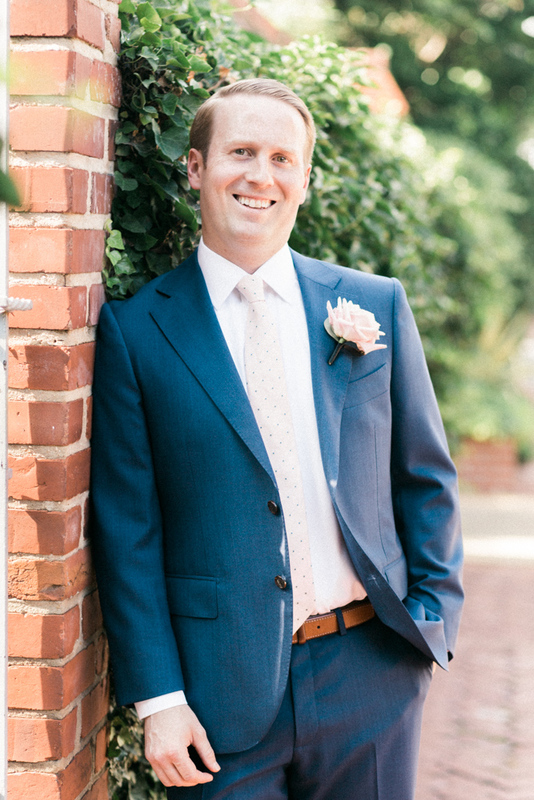 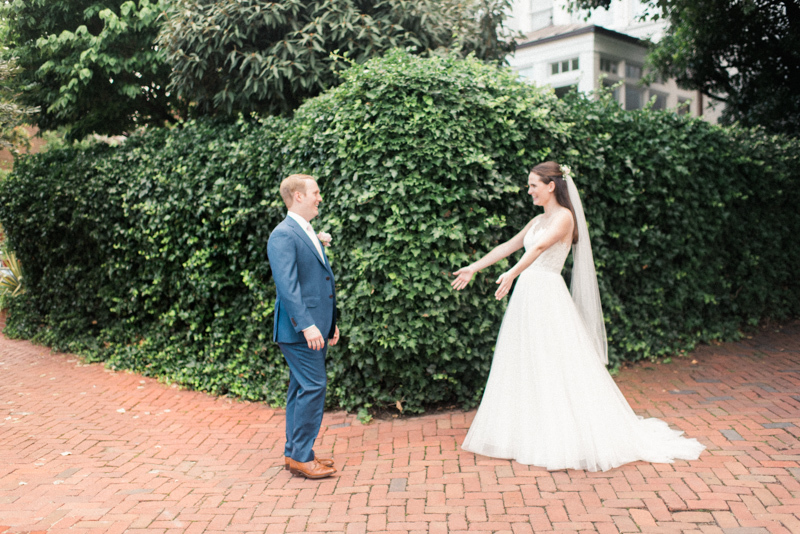 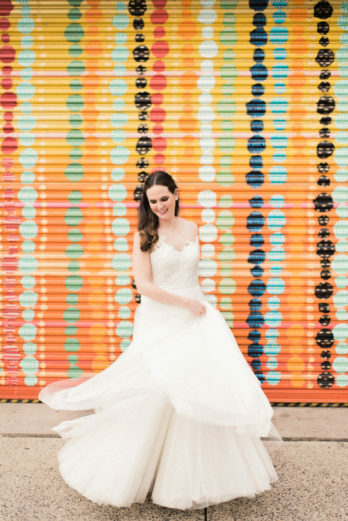 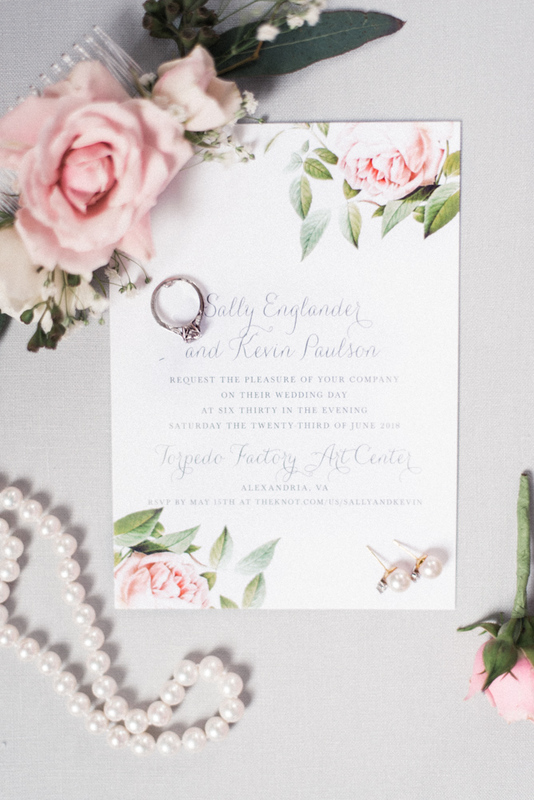 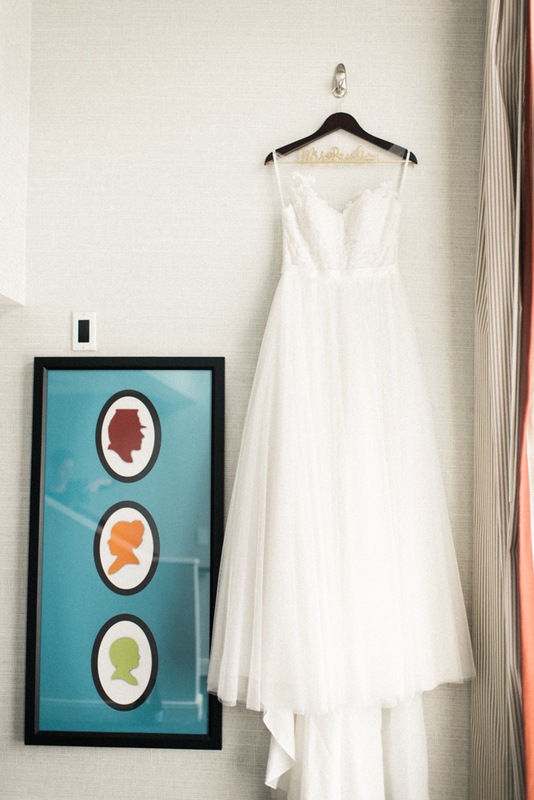 Sally and Kevin were married June 23rd at one of Old Town Alexandria’s famous wedding venues, Torpedo Factory. 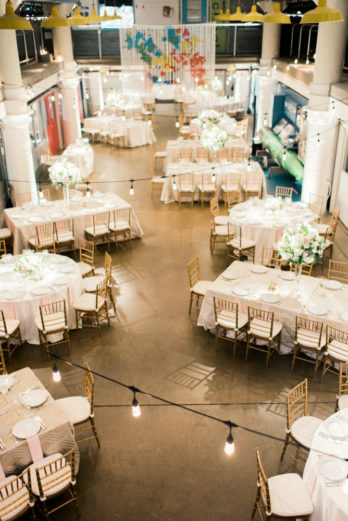 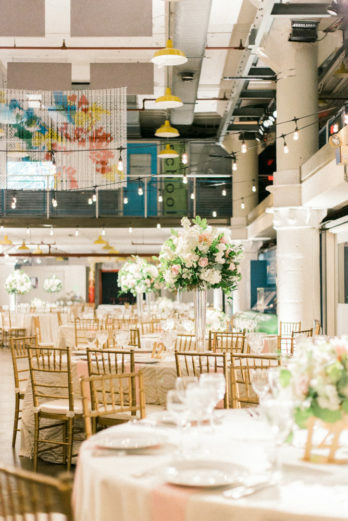 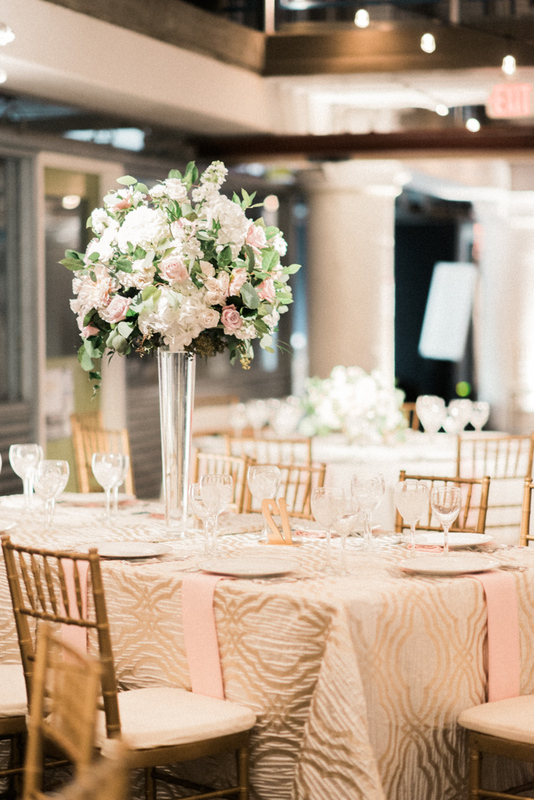 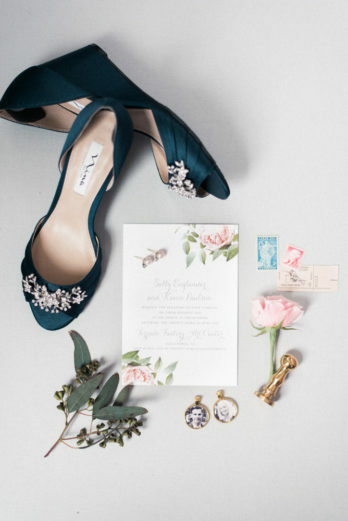 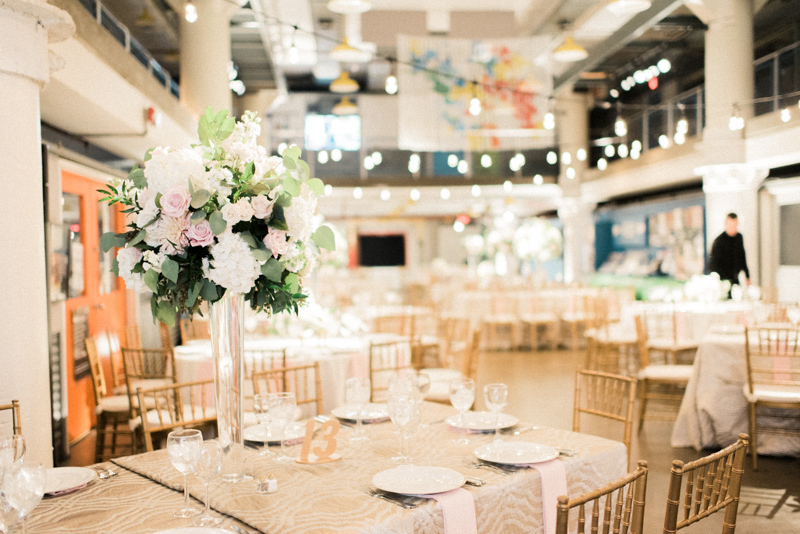 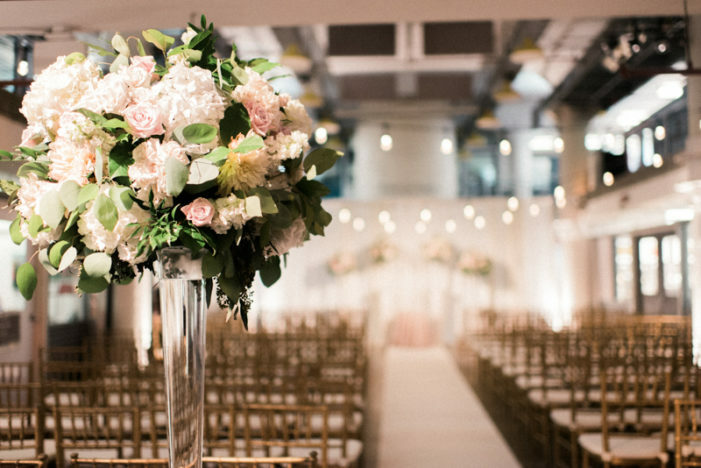 The Torpedo Factory’s industrial feel was softened through the use of an abundance of blush, gold, ivory and green tones. 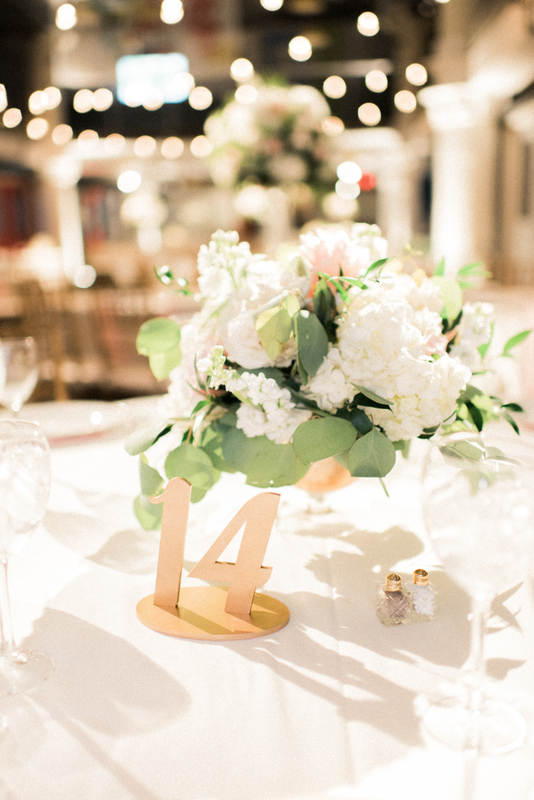 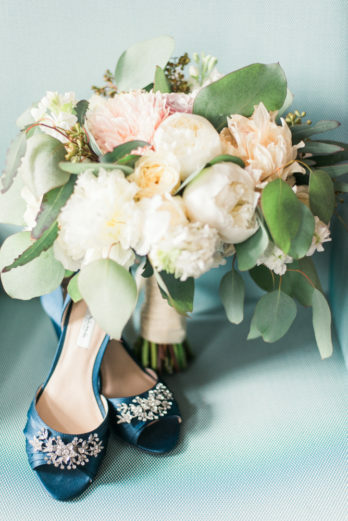 The florals created by Petals Edge, brought all the colors of the wedding theme together in the bouquets as well as the tall and low centerpieces for both the ceremony and reception spaces. 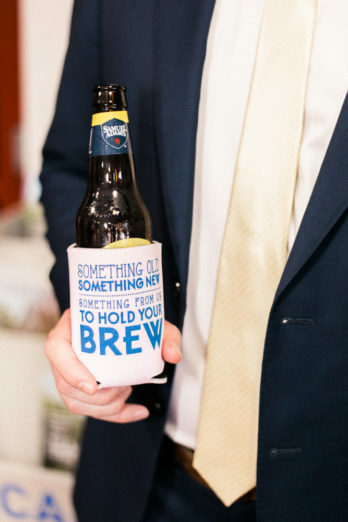 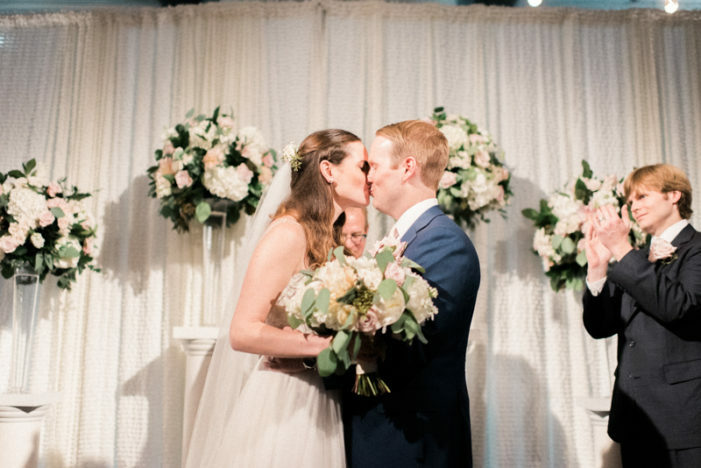 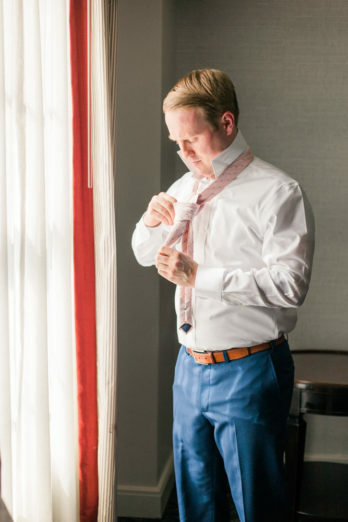 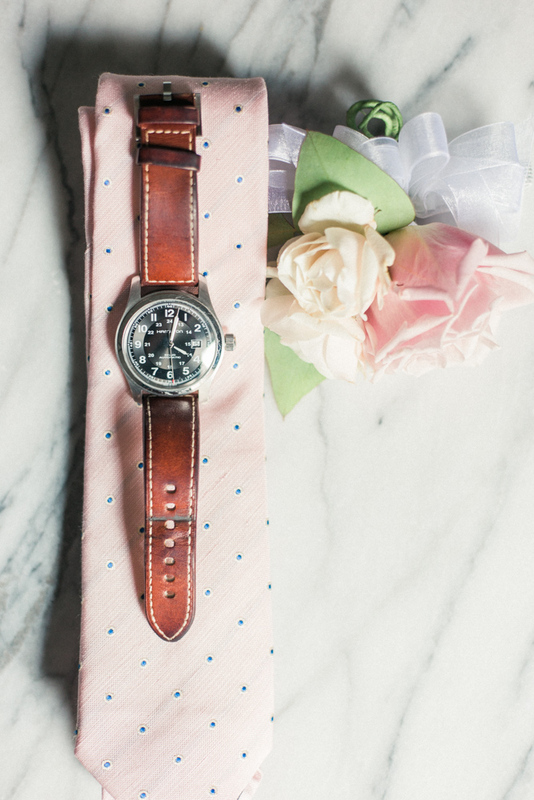 Sally and Kevin kept their bridal party small and intimate, to only include their siblings. 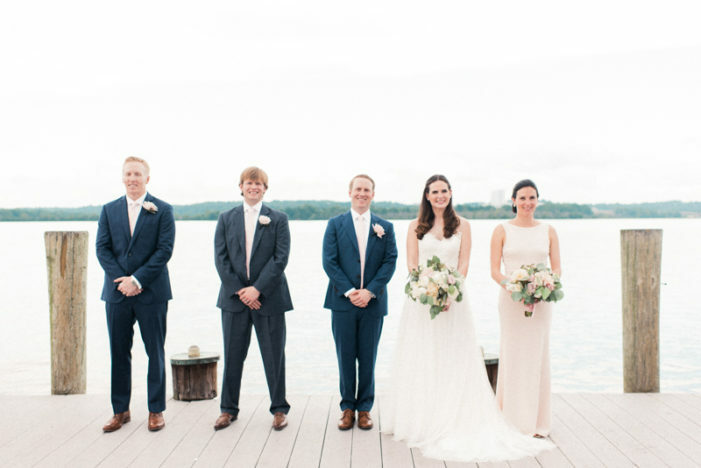 Sally’s sister wore a blush cowl back dress; while Kevin and his brothers wore navy blue suits accented with blush ties. 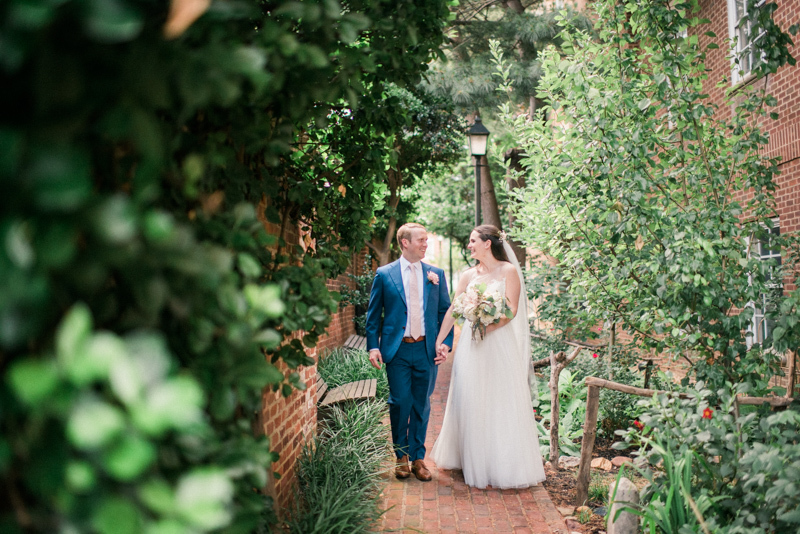 After getting ready at The Alexandrian, Sally and Kevin spent the afternoon walking around downtown Alexandria. 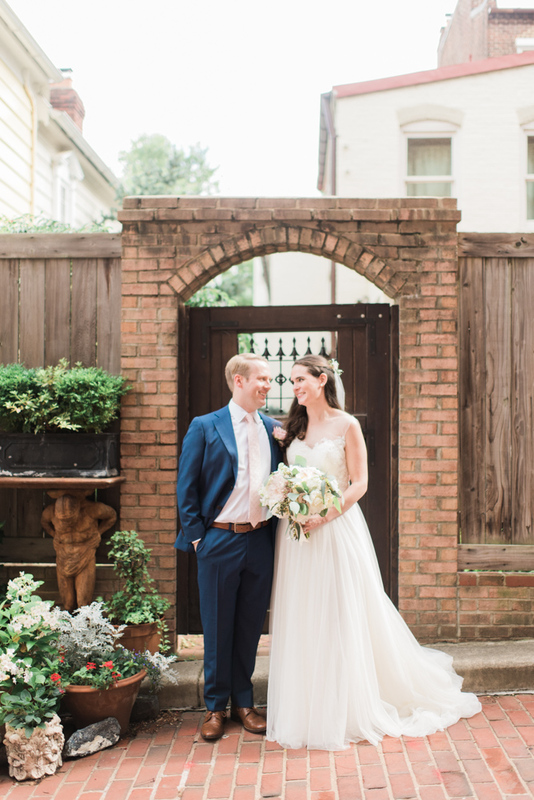 They stopped at their favorite spots (including Virtue Feed and Grain, where they first met) for portraits before the festivities began. 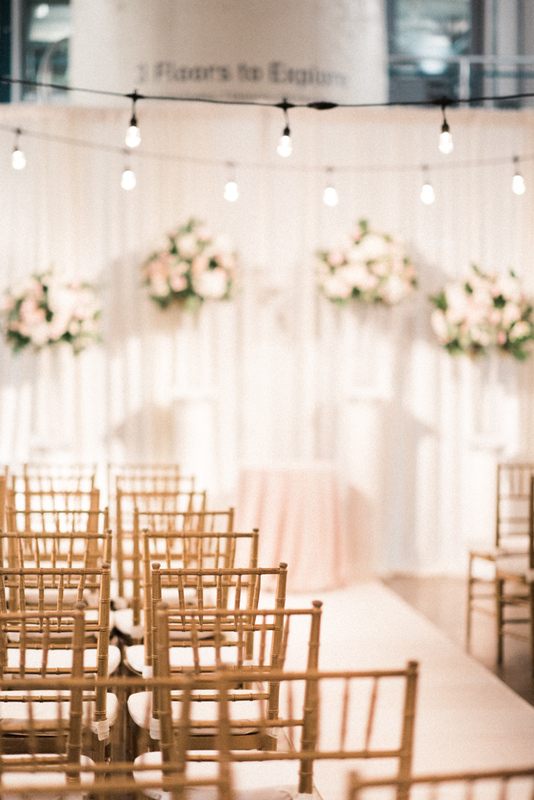 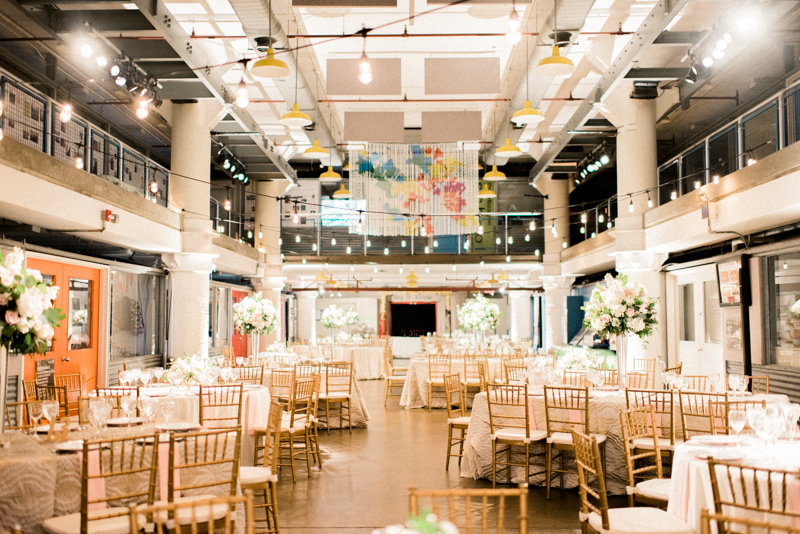 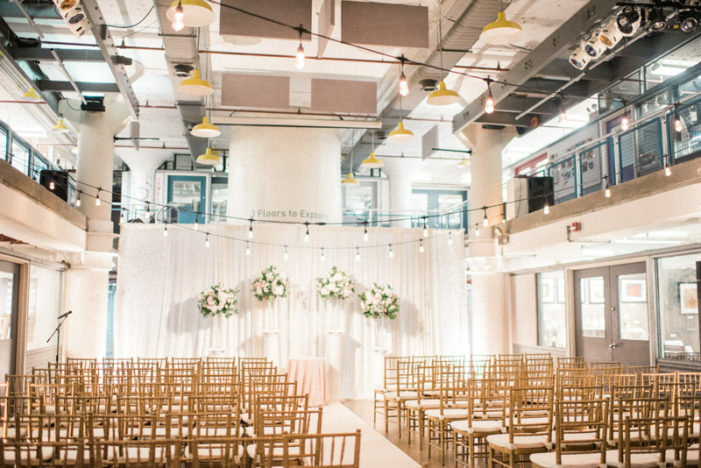 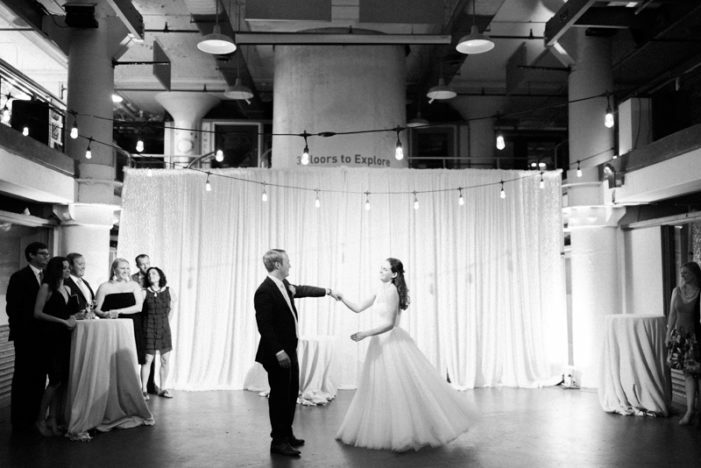 The Virginia ceremony took place at the Torpedo Factory underneath a covering of string lights. 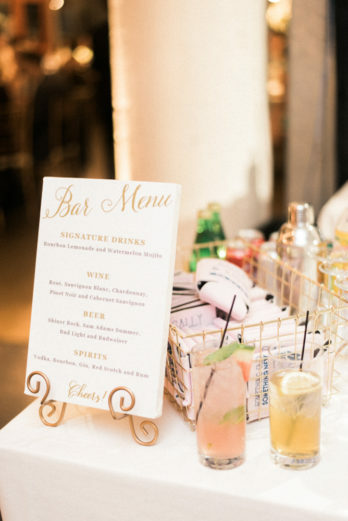 Cocktail hour allowed Spilled Milk to show off their creative plating. 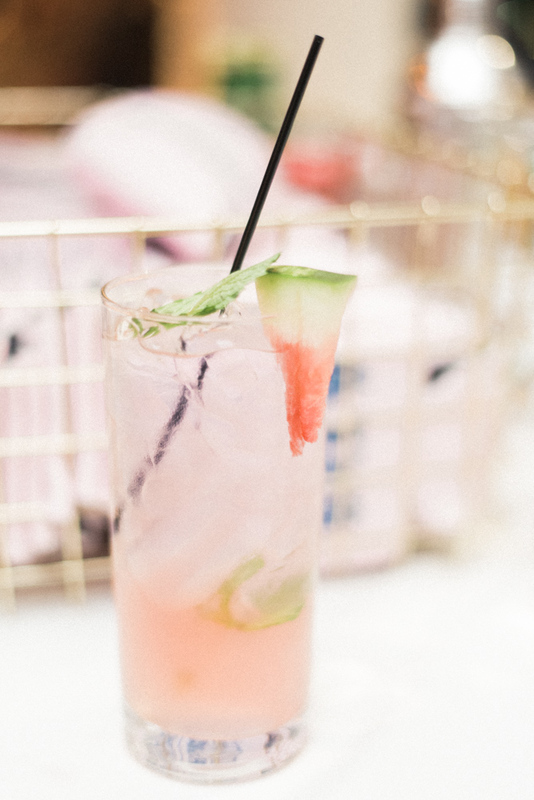 They were complete with with their mini tacos (in limes! 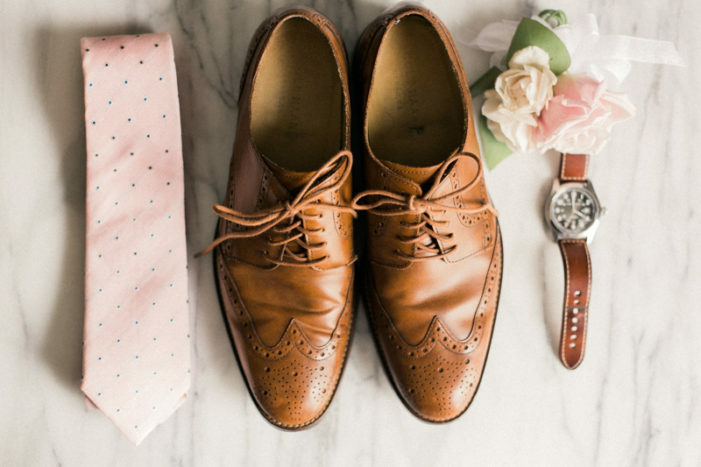 ), bites of bacon, and buffalo chicken fried bites. There were in seved on skewers stuck in a tray of fake grass! 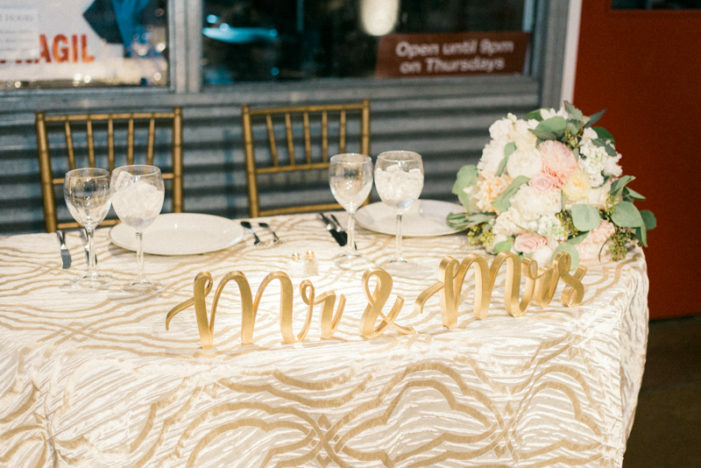 Spilled Milk continued to impress through dinner; they served chicken and waffles, a meal the guests continued to rave about long after dinner had been finished. 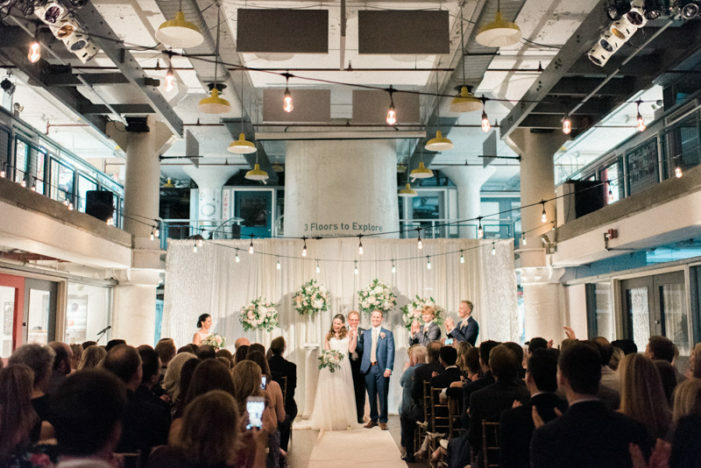 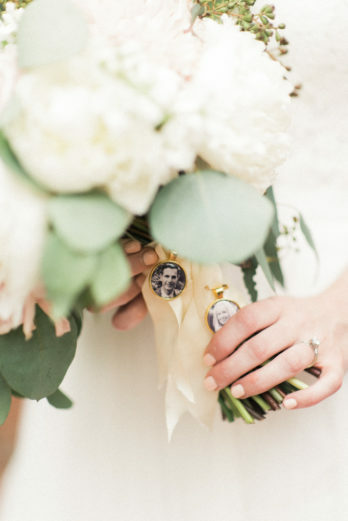 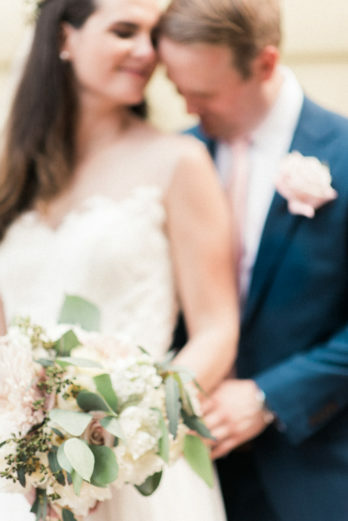 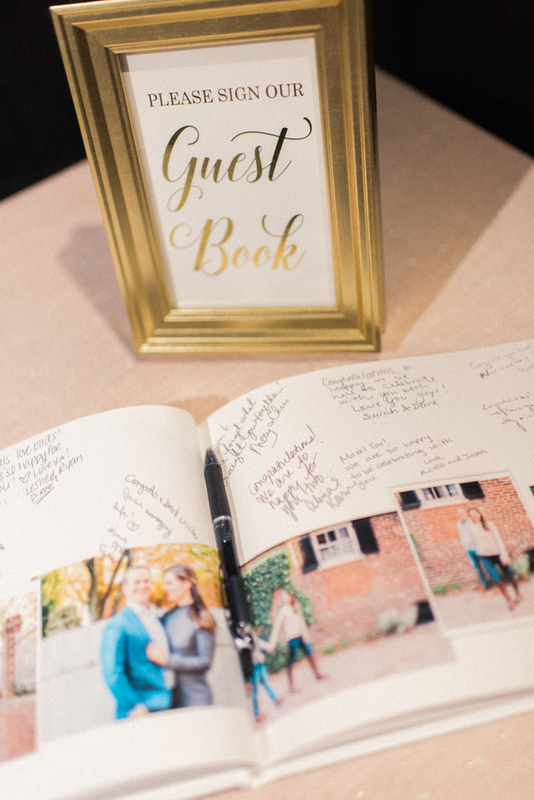 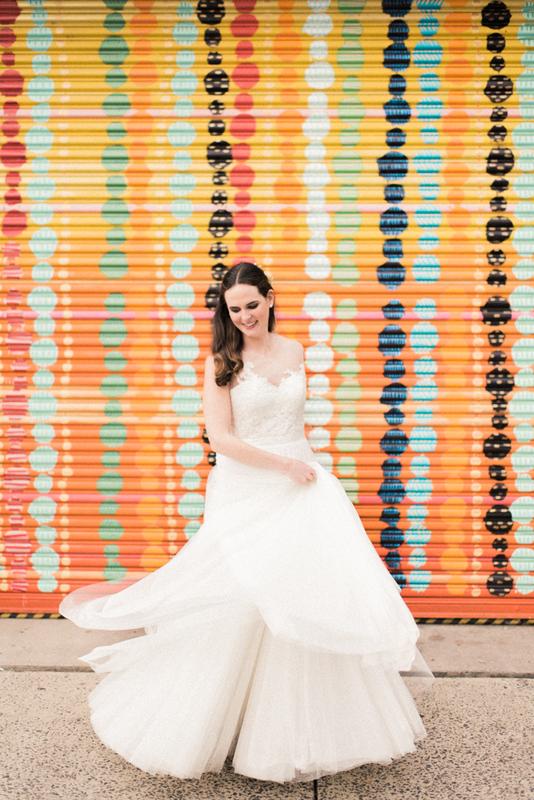 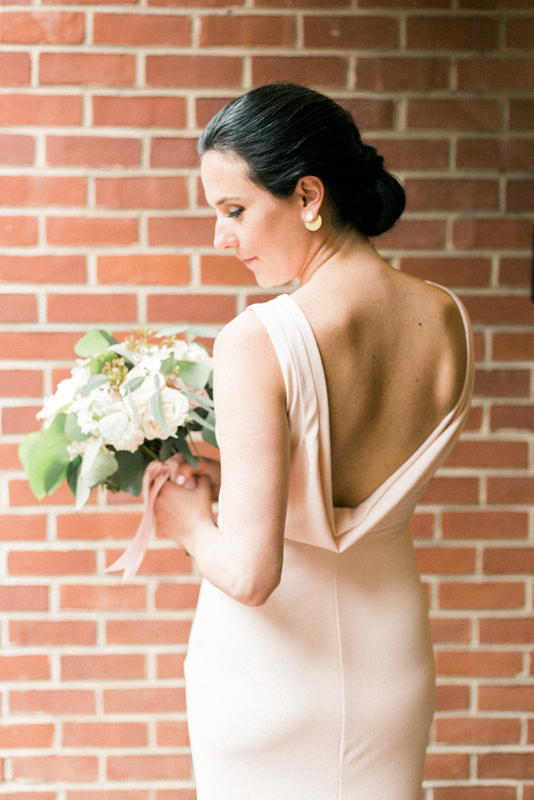 Thank you to Meghan Elizabeth Photography for sharing this golden Torpedo Factory wedding with us today!